BANGI, 5 Nov, 2012 – The response time to aid victims of natural disasters and provide them for their recovery needs to be improved. 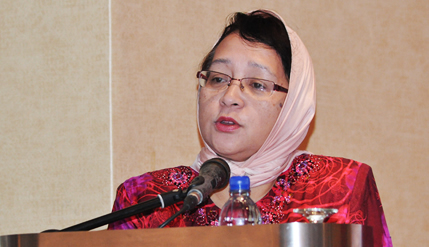 The National University of Malaysia’s (UKM) Deputy Vice-Chancellor (Research and Innovation) Prof Dato’ Dr Rahmah Mohamed said research on how to speed up the first respons to natural calamities should be done in detail. She was opening the first Workshop on Natural Disasters and Climate Change in Asia jointly organised by UKM’s Southeast Asia Disaster Prevention Research Institute (SEADPRI) and the Cambridge Educational Development Trust. More than 30 scientists and representatives of non-governmental organisations (NGOs) took part in the three day workshop aimed at considering the possibility of creating a network to better exchange information and collaboration between research centres. Prof Rahmah said the first respondents may be quick on the scene but more needs to be done on the time of recovery of victims and their effectiveness. Preparations for the aftermath of natural disasters must also be given priority saying that more innovative systems be put in place to deal with the natural calamities. Leadership of recovery efforts and management of the aftermath should be studied in detail to help save lives and time. People living in high-risk areas should also be informed of what to expect if the worst happens expressing the hope that the proposals from the workshop will be considered by the relevant authorities and governments. Researchers made their presentations for every theme discussed followed by panel discussions after each theme. Among the researchers were Prof Johnny C L Chan from the City University of Hong Kong, Dr Keiko Takahashi from the Japan Agency for Marine Earth Science and Technology (JAMSTEC) and Prof Fredolin Tangang of UKM. Eminent climatologist, Emiritus Professor Lord Julian Hunt of the University of Cambridge; SEADPRI-UKM’s Director, Prof Mazlin Mokhtar and Deputy Director, Prof Joy Jacqueline Pereira who served on the steering committee took part in the discussions.